In my first post about Life in London, I promised to write a bit more about things to do in London, as it’s one of the most popular and important cities in the world. The capital city attracted 15.5 million foreign tourists in 2012, who spent £10 billion here according to Visit Britain. Tourism in London is big business and just because I live here doesn’t mean I shouldn’t write about things going on here. So here’s a round up of what’s hot in London right now, and I’d love to hear what you’ve loved about the city as well. Last week saw the opening of the infamous Gordon Ramsay’s latest venture in London, Union Street Café restaurant and bar, in the slightly unusual location of Borough/Southwark. I went to a preview of the artist’s-warehouse-feel cocktail bar that’s lovingly looked after by Absulai Kpekawa. Don’t bother asking for your ‘usual’ as they are masters of the art of cocktails and take pride in serving up their own concoctions. I highly recommend the Southwark Angel, which is made of gin, cucumber, green Chartreuse and lemon juice, completed with raspberries so you can hold onto the taste of summer as long as possible. Although I was treated to some scrumptious Italian canapés, the cocktail bar doesn’t usually serve food and you can head upstairs to the restaurant for a bite to eat from Ramsay’s menu. Although the press has made much of the fact that it was immediately booked up until November, they do keep tables for walk-ins so it’s always worth a try if you’re in the area. As a big art aficionado, I did of course inspect the artwork adorning the bare-bones walls and it’s apparently all available to buy for anyone with enough space to do it justice (see the photos above). The venue has a seriously ‘cool’ vibe to it and I will definitely be returning to Union Street soon. The Victoria and Albert museum in South Kensington can always be relied upon to host good fashion exhibitions. A few months ago I went to ‘Ballgowns: British Glamour Since 1950′ and at the moment there’s an exhibition on London fashion in the 1980s, called ‘Club to Catwalk’ and running until 16th February 2014. I’ve always had a pretty negative opinion of the 1980s when it comes to clothes, as the pieces left over from that era in my mother’s wardrobe are simply not my taste. Shoulder pads – really? The exhibition is split over 2 floors, the first portraying the styles that British designers of the day (Vivienne Westwood, John Galliano, Betty Jackson, etc.) were creating for the catwalk. The shapes and colours are ‘huge’ and something to behold, and completely unwearable even then I imagine. There are some mini-films of 80s catwalks and I have to say that the models look like they’re having a whale of a time! A far cry from today’s vacant, bored expression son models as they strut and do little else. Look out for the customized Levi’s denim jackets, a project commissioned by the magazine Blitz – see if you can spot the tea strainer in there. Upstairs is dedicated to how London reacted to these new trends played out on the catwalks. Things got a little more extreme in the real world as fetish, goth, lycra and shaven heads on girls took over certain London clubs. David Bowie and Boy George are ever present in the photos and mini-films and with a bit of context I now understand why they dressed so damn strangely! It looked like a pretty debaucherous decade in London, and I can’t help feeling that the 2010s in comparison are rather bland! Not that I’m angling for a Louis Vuitton bumbag anytime soon (see if you can spot that one too). 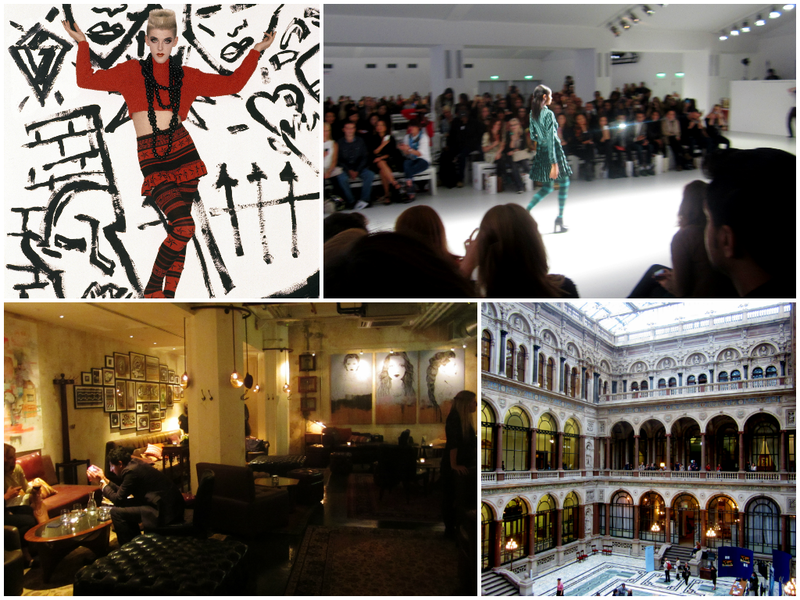 It is once again that time of year (the “Fashion Month”) and London Fashion Week has just finished. Luckily for everyone else, there’s also the “Weekend“, in which they have catwalks of the trends shown in the previous few days, talks from key figures such as fashion journalist Hilary Alexander and pop-up shops throughout Somerset House, as well as champagne bars and manicure bars. Completing my weekend of fashion after seeing the V&A exhibition on Saturday, we strolled around perusing clothes, falling in love with fur-trim shawls by Hayley Menzies and people-watching as London’s bravest fashionistas donned their most daring outfits before watching the catwalk. Afterwards we headed to the picturesque Brasserie Blanc restaurant/bar in Covent Garden for a drink to round off the weekend. For one weekend each September, over 700 buildings in London open up to the public in the name of promoting the city’s great architecture. Last year during Open House London weekend I focused on buildings in Hammersmith and Fulham, such as the Palace Wharf Artists Studios right on the Thames, and so I widened my reach this year to include the iconic Foreign & Commonwealth Office and Battersea Power Station. For anyone who hasn’t heard of the later, it’s an enormous but derelict construction on the south bank of the Thames, which is due to be re-developed into flats shortly. Last weekend was the last opportunity the public will ever have to explore inside the abandoned old building, which has seriously decayed, and is quite eye-opening to see it in person. As such it was very popular and after a queue of just over an hour, we finally got inside and were able to marvel at just how decrepid a building can become… Literally whole parts of the building have crumbled into nothing. What’s surprising is its prime location in the centre of London on the river – it’s impossible not to wonder why something hasn’t been done with it sooner (it was abandoned in 1975). What have you got planned in London over the next few months? You have a genuine talent with words.